Note: Broke his maiden in his 3rd start last year. 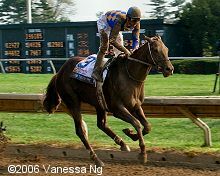 Was 2nd in an allowance in his 2006 debut then was a miserable 6th by 17 lengths in the Tampa Bay Derby. Came back in the Blue Grass to close well at the end and get 2nd over 12 lengths behind Sinister Minister. Never ran a lick in the Derby and finished 11th, beaten over 20 lengths.